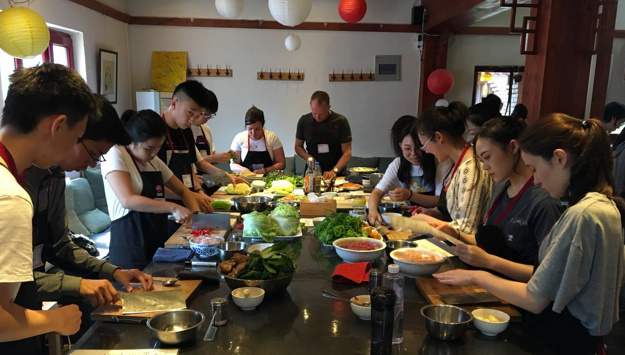 Before being let out of school for summer vacation, students from grades 9 through 11 from The International School of Beijing spent four days at our hutong courtyard learning how to prepare classic regional Chinese dishes through our Fun with Food program. Our goal was to give students the skills to cook new dishes at home and to learn about foods from different regions of China. When the program started, students’ culinary skills ranged from barely knowing how to make rice to cooking with their parents most nights. In the end, every student expanded their knowledge of ingredients and seasoning, raised their comfort level with handling a wok and left having greatly honed their knife skills. Students certainly had “fun with food” throughout the program and also gained the skills and confidence necessary to make dishes they may have never tasted, simply from reading a recipe. On the first day, students learned the ins-and-outs of a Chinese kitchen’s pantry essentials—light and dark soy sauces, chili oil, white pepper, Sichuan peppercorn, vinegars, and more. Students familiarized themselves with these ingredients and flavours and learned how they are used in regional Chinese cuisines, their diverse applications, and how they affect the flavour and texture of a dish. Preparing Chinese food likely requires more technical knife skills than any other cuisine in the world! In order to prepare stir-fried dishes so that the vegetables retain their crisp texture and the meat is cooked but not dry, ingredients must be cut into precise sizes and shapes. Our chefs gave students a series of exercises on how to slice, chop, mince, and debone, as well as how to create shapes like dice and julienne with an assortment of vegetables and meats. These skills form the backbone of producing excellent wok-fried dishes. Provincial cooking styles and flavor profiles in China are incredibly diverse, ranging from the smoky hot of Sichuan, to the sour, herbal flavors of Yunnan, to the delicate, sweeter seasonings of Guangdong. In order to better appreciate the breadth of Chinese cuisines, students spent the first three days focusing on classic preparations from different provinces. On day one, students practiced their knife skills while preparing dishes from Sichuan, like Spicy and Sour Shredded Potato and Fish-Fragrant Pork Slivers. Dishes like Smashed Cucumber Salad taught students how a Chinese cleaver can be used for more than just chopping, but also crushing garlic and smashing soft vegetables like cucumbers. Learning how to infuse oil with spices like bay leaf, cumin, and cassia also imparted an appreciation for layering flavors. There are so many delicious noodles from all over China, so it was difficult to decide on just one region to represent on our second day, when we focused on making noodles from scratch. Hand rolled noodles and “cat-ear” noodles from Shanxi are both fun to make, but convenient enough to actually reproduce at home. From kneading the dough to rolling out the noodles in their respective shapes, students learned hands-on how delicious fresh, homemade noodles taste. A classic tomato-egg sauce as well as caramelized pork and eggplant sauce were perfect accompaniments. On day three, our chefs introduced students how to prepare classic dim sum and other dishes from Guangdong, including pork suimai, fried rice noodles with beef, vegetable spring rolls, and soy sauce chicken. Compared to the stronger, bolder flavors of Sichuan and Shanxi, students were introduced to the lighter seasoning techniques employed in Cantonese cuisine. One of our signature activities in our courtyard is the Hook n’ Cook, a friendly cooking competition where we pair people up, give them a recipe and an hour to make it. On day four, students weren’t led by an instructor through the preparation and cooking process, but instead had to create the dish without much oversight through a Hook n’ Cook activity. Day four represented the culmination of the student’s newly acquired culinary skills: many had to make a dish they hadn’t eaten before without step-by-step guidance. This is how we had hoped to empower students—to continue to seek challenge after the program is over by trying to cook new recipes at home. The skills built over the first three days of the program shined through as every dish turned out beautifully! In many ways, the classic dishes we prepared on the first three days aren’t meant to be messed with; most Chinese dishes are tied to a specific region and have their own histories, so we felt it’s not our place to alter them. Where students did have the freedom to exercise their creativity, however, was in presentation. There are no limits to how imaginative you can get with plating, and we saw that when students presented the dishes they prepared for the Hook n’ Cook. Plating styles ranged from minimalist to cute with some very memorable presentations!